I am in a town called Aguas Calientes. I had my first hot shower in three days. Tomorrow morning I will get up at 4 am to climb 1017 steps to Machu Picchu. I am doing what is called the Inca Jungle Tour and we are at the end of the third day. It is an alternative route with added ‘adventurous’ elements. I opted for this tour because I have been told many times that the original route had turned into a very commercial and crowded experience. But this trip is purely invented to create an entertaining experience and it has not much tot to with the original Inca Trail. The down side is that the feeling of being trapped inside a commercial endeavor is inevitable. For example: the pick up is at 6.30. That way it is guaranteed that nobody had breakfast at his or her hostel. Consequently the pick-up is half an hour late and there is no rush at all. In reality everybody could have had breakfast in the hostels and we would still be on time. But then nobody needed to buy any food at ‘the last stop’ where you can buy breakfast, sunscreen, repellent and all the others things that one could use against airport prices. Every day has two or three of those surprises. The upside is that we get to walk through nature. On the second day we were the only group on the trail and today, the third day, I walked the whole stage alone because I went ahead of the groups. And it is nice to walk though magnificent nature and not hear people talk. Yesterday we walked for a little while over an authentic part of the trail. It is quite mind blowing: during the Inca empire Cuzco was the navel of the world and they had paths in all 4 major directions of the wind. The narrow, 800 year old mountain trail we were on would take you all the way to Quito, Ecuador. Covering that distance will take you 58 hours by bus nowadays. I know because I did it. I had a nice little insight walking in the trail. I was making a video while walking and while I walk the path I see that there had been a little land slide covering the path with rocks. So I have an ‘obstacle’ on my ‘path’; quite a nice metaphor for the spiritual path or life of course. What to do? Well, face the obstacle and overcome it of course. So I climbed the rocks and I realized that once I was on top of the obstacle I had a better view. This I never realized before. Not only is it necessary to face our obstacles because we will stagnate and limit ourselves if we don’t but when we are on top we even have a better view on our life than before. Then there was second insight that I find a little bit more difficult to explain. I am still reading the book about Near Death Experiences by Dutch cardiologist Pim van Lommel. He argues that our awareness does not live inside our bodies (otherwise it would be impossible to have very vivid memories from the time the body was clinically dead). Our bodies are merely a temporary vessel. Our awareness can expand infinitely. While I was sitting on the Inca trail far away from wifi and civilization I realized that the trail is the product of a thought from the first Inca king. I was sitting on the materialization of his thoughts and vision. Meanwhile things that I have set in motion in New York and Hong Kong were moving without my physical intervention. People are visiting my website while I am in the jungle. Thoughts and insights on masculinity that I wrote down almost 2 years ago are read 40 times per day. More than 30.000 people read my recent posts on The Good Men Project: nothing more than my thoughts translated to the screen with my fingers and shared with people who make it appear on other screens. I am seeing in a new way how much our thoughts are shaping our reality. We can take responsibility for our thoughts. We can have fearful, selfish or selfless thoughts. We can have small, narrow-minded or grandiose and passionate thoughts. We have the choice to choose from all our thoughts the most beautiful and inspiring ones and follow up on them. We can start building on our thoughts, let thoughts become a vision and with that vision shape our reality. And if this is true, why should I let myself be hindered by all these negative thoughts about my childhood, about my limitations and what other people think of me? We are limited by our conditioning, by what we have learned to assume as impossible or inappropriate. I am realizing more and more that I am no longer a victim of that. And I find more and more courage to create what I want to create. Actually, it just makes less and less sense to limit myself. To conquer the world we need to conquer our minds to release our most heartfelt vision. I like that. It sounds doable and uplifting. What do you think? Is it time to release your most compassionate vision yet? PS: This was my 250th post! Wow! 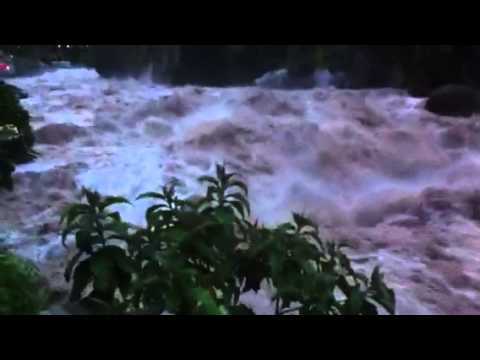 Let’s celebrate with a little video of the awesome forcefulness of nature. Can you imagine that you possess a similar strength inside?